Moana Hope celebrates Collingwood's win over the Western Bulldogs. Collingwood has its first win of the AFL Women's competition, blitzing the Western Bulldogs in the third quarter to spark a seven-point win at the Whitten Oval on Saturday night. The Magpies kicked four goals in the third term alone, after coming into the match having scored just eight majors in total over their past three games. The burst set up the 5.2 (32) to 3.7 (25) win. The tight, scrappy affair was soured by a potentially serious knee injury to Collingwood rookie Kate Sheahan. The forward, coming in as an emergency for her first game, changed direction attempting to evade an opponent and fell to the ground clutching her knee just seconds before half-time. Sheahan, the daughter of veteran journalist Mike, was carried from the ground by trainers visibly distressed. Magpies coach Wayne Siekman said Sheahan will undergo scans to determine the extent of the injury. "Obviously it's a knee, and the docs let me know she will have scans on Monday," Siekman said. "Fingers crossed it's not the worst, that's all we can do at the moment, just hope for her." Ellie Blackburn, acting Bulldogs captain after the late withdrawal of Katie Brennan, wrestled her team back into the contest in the second quarter after a lacklustre opening term. She had 10 disposals to half-time, and finished with 19 for the match. Meg Hutchins was a rock in defence for the Magpies, cutting off numerous Bulldogs entries and setting up play with her booming right foot. Alicia Eva (14 disposals, one goal) and Jasmine Garner (two goals, five marks) were among the Magpies' best, especially in the third quarter. Jess Cameron's great ball skills set up Eva's goal. Cameron continually tapped the ball along the boundary line, evading two defenders, before handballing to Eva who snapped truly. With their season on the line, the Bulldogs came out firing in the fourth quarter, putting the Magpies under enormous pressure. Blackburn kicked a goal inside the first minute, with Kirsty Lamb adding her second minutes later. But the Magpies slowed the game down in the final minutes, chipping the ball around to the dismay of the Bulldogs' faithful, to hold on for their first win. Sides have tried and failed to kerb the influence of Bulldogs midfielders Ellie Blackburn and Emma Kearney, and that was nearly the case again the case on Saturday night. Blackburn was taken as a marquee player by the Dogs and her class is evident. She runs hard, creates and brings teammates into the game. Kearney, while quieter than normal, still finished with 13 disposals. The two seem to work as a tag-team – one is dominant while the other is quiet. If the two get going at the same time, the Bulldogs will be tough to beat. The Magpies have struggled all season to kick goals, with poor delivery inside 50 a serious issue. But they were much more direct on Saturday night, constantly putting pressure on defenders, and kicked four goals in the crucial third term while holding the Bulldogs scoreless. Questions surrounded the Bulldogs' scoring power, especially after the late withdrawal of marquee forward Katie Brennan. But Kirsty Lamb, who plays for Melbourne Uni and cricket for Melbourne Renegades in the Big Bash League, stepped up and filled some of the breach. While not as skilful as Brennan, she kicked two goals and provided a useful target in the forward line. 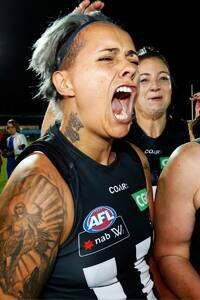 At 163cm, Alicia Eva is one of the smaller players on Collingwood's list, but she's also one of the more ferocious. She hassles opponents, disposes of the ball well, and is dangerous around goal. But she showed another side to her game on Saturday night, going head to head with the damaging Emma Kearney (leading disposals for the competition) and just shading her, finishing with 14 disposals and a goal to Kearney's 13. The Bulldogs will be desperately trying to keep their finals hopes alive, in a must-win clash against Carlton at Ikon Park on Saturday morning. Collingwood will travel to Rushton Park in Perth to play Fremantle, also on Saturday morning. Both matches are double-headers with the men's sides.